Langdon Rural Water Users Inc.
Norwegian Fjord Horses for sale. Gentile, versatile and hardy horses. Driving or riding in all disciplines. New building, remodeling, concrete, shingling, pole buildings, all-steel buildings, taping and texturing. The Edinburg Business Club, established in 1963 boasted a membership of nearly 40 businesses, some large and some small; some recently established and some established 100 plus years ago. In 2007 the Business Club changed itself into the Edinburg Community Club inviting not only business people but everyone interested in the Edinburg Community to join. We have had a great turn-out at our monthly meetings. Learn more about the Community Club and its activities and events on the Commumity Club Page. The Edinburg American Legion Davidson Post 156 was chartered in 1920 as was the American Legion Auxiliary. They are an active unit and sponsor a Junior American Legion Drill Team. This girls group has performed at numerous local functions and has been the color-guard of choice several times at the Class B State Basketball Tournament. 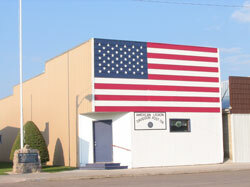 The American Legion building on Main Street proudly bears a replica of our United States flag uniquely painted on its front. Rendezvous Region Bird Club held its first meeting at the General Store in February 2001. The club is under the leadership of Janne Myrdal and the guidance of Mike Jacobs of the Grand Forks Herald. Mr. Jacobs, a renowned birder, has been present at many meetings and continues to write articles on birding in each Sunday's edition of the Herald. Learning about the tremendous potential for the birding industry from Mr. Jacobs at an Agritourism Conference held in Edinburg spurred ideas for the Bird Club. Interested birders are invited to attend meetings. The Rendezvous Region Bird Club has sponsored Bird Counts in the area.